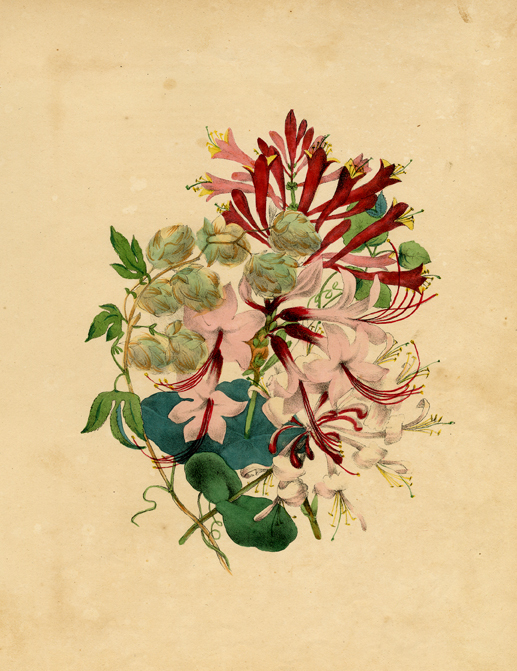 Today we are happy to share a new Past/Present post, featuring two stunning honeysuckle prints. The older print is a scarce lithograph, with original hand color, from “Flora’s Dictionary,” by Mrs. E.W. Wirt of Virginia. With a publication date of 1837, Mrs. Wirt’s book is one of the earliest colored botanical works published in America. Rather than depicting a single flower, each plate shows a carefully selected grouping. As Bennett notes, “The arrangements of flowers are beautifully balanced and the coloring is brilliant.” (Bennett, “American Color Plate Books, 115). The woodcut is by English woodcut artist Mayel Allington Royds (1874-1941). Royds grew up in Liverpool and turned down a scholarship at age of fifteen to the Royal Academy of London, in order to attend the Slade School of Art and study under the formidable Henry Tonks. After an apprenticeship in Paris working in the studio of Walter Sickert, Royds accepted a teaching post at the Havergal College in Toronto. She later returned to the UK to teach at the Edinburgh College of Art where she met three people integral to her artistic development and life: Samuel Peploe, a Scottish post-impressionist painter highly regarded for his mastery of color, Frank Morley Fletcher, under whose influence she took up Japanese color woodcuts, and her future husband, Scottish etcher E. S. Lumsden. Together Lumsen and Royds traveled to Tibet and India, their experiences serving as inspiration for her later woodcuts, both in design and in the use of saturated, rich color. The scenes she created of India from 1920 to 1930s are some of her more renowned work. 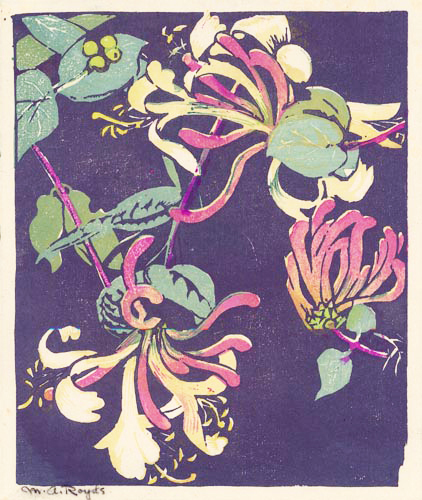 From 1930 to 1933, Royds created a series of flower prints, which utilized her bold color work and Japanese woodblock technique. These stunning compositions, including Honeysuckle, are now part of the permanent collection at the National Gallery of Scotland. Royds was a regular contributor to the Society of Scottish Artists, the Society of Artist Printers, and the Graver Printers in Colour, exhibited her work in Scotland, Manchester, and further abroad. Hope you enjoy these two prints! Image on the left: Honeysuckle, Coral Honeysuckle, Wild Honeysuckle, Hop. Plate XXIV. From “Flora’s Dictionary,” by Mrs. E.W. Wirt of Virginia. Embellished by Mrs. Anna Smith. Published by Fielding Lucas, Jr., Baltimore. Lithograph, original hand color, 1837. Image size (vignette) 7 x 5″ (175 x 130 mm). Image on the right: Honeysuckle. By Mabel A. Royds. Woodcut printed in color, 1935-38. Edition unknown. Image size 8 x 6 /12″ (203 x 165 mm).